Prologue of the project and goals. Know the team who made this possible. Under a mass of jeers and whistles, Gustavo Mejia makes his way to the plate. His royal purple jersey stands out in sharp relief against the dead grass and worn cement bleachers. A hush falls over the small crowd as the pitcher starts his wind-up. One foot kicks out, and his hips flex, coiling his body like a steel spring, ready to impart maximum force on the ball. As it flashes toward the plate, it hangs at the top of the strike zone. Gustavo throws his bat onto the hardpan field and takes off running as the ball soars over the second baseman’s head. At first base, Celso Mejia, his father, waves him around to second, where he’s safe. His brother Jesus rounds third base, and streaks home, scoring easily. 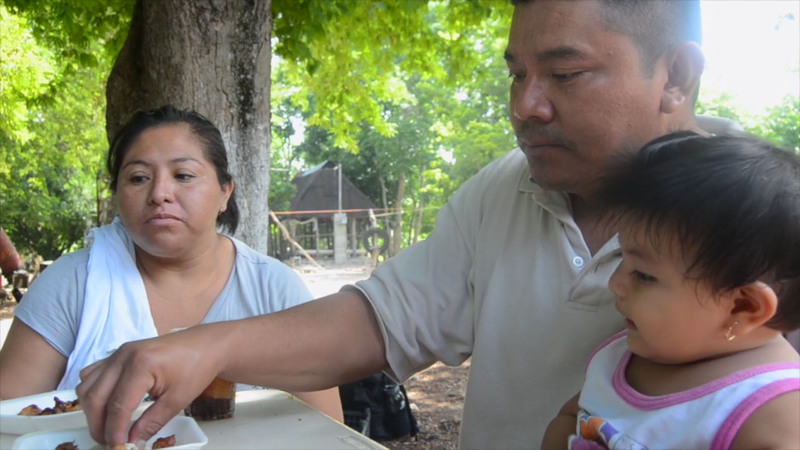 Many families of migrant workers deal with separation, but baseball is a way for the Mejia family to stay connected, even when they can’t be together. Celso works in Merida, the capital city of Yucatan State during the week. He commutes from his home in the village of Tunkas, only spending weekends with his family. 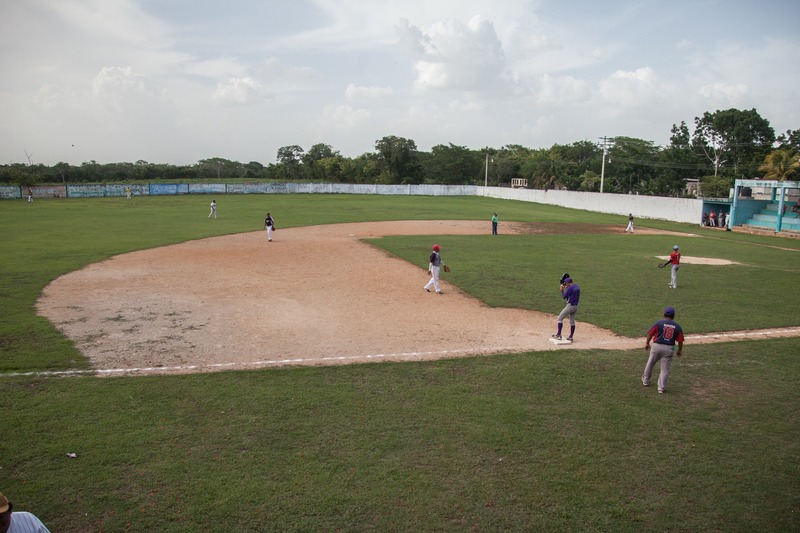 As the game wears on, he stands at the front of the dugout, hands on his hips, calling out formation shifts to his team, the Guerreros de Tunkas, as different batters step up to the plate. His role as a manager is a complex juggling act, but no more so than his role as a father and husband. While migration can tear families apart, some successfully fight to stay together in spite of the challenges they face. Celso Mejia spends the weekdays away from his family working in a larger city where the pay is higher and the jobs are better. But his heart never leaves his family in Tunkas, and on weekends he reunites with them and bonds over a shared passion for baseball. He is determined to beat the odds and keep his family together. For now he thinks they’re winning. 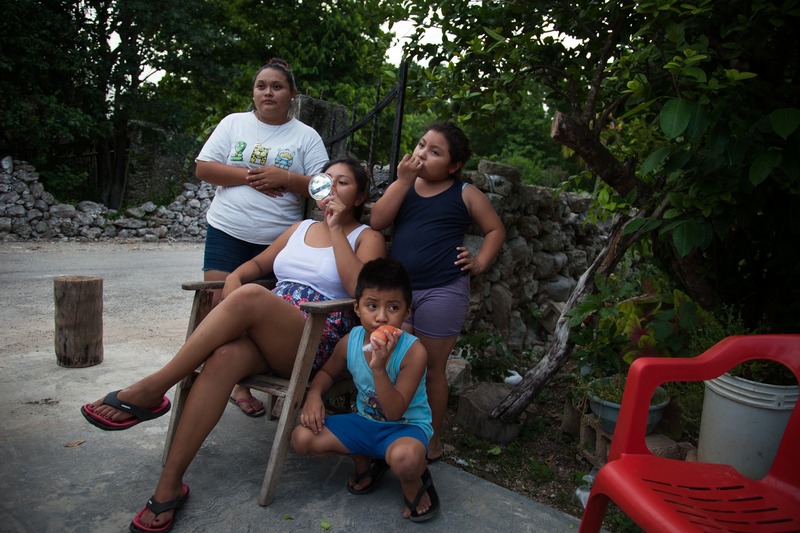 Across Mexico, soccer is the most popular sport, but in the Yucatan, things are different. Here, baseball is king. Florentino Che, another coach on the Guerreros staff, has been part of dozens of teams over the years. Baseball, and sports in general, are a common way for parents to bond with their children all over the world. But in Tunkas, where so many men have to migrate and are absent for extended periods of time, the stakes are so much higher. Many fathers can’t come home on a regular basis, and in some cases in Tunkas there are fathers who have never met their children. Baseball can help provide discipline and a framework to boys who lack direction. But the very existence of the team would be impossible without the financial assistance provided by migrant labor. Remittances, the packages of money sent home from workers in the United States, still known as braceros, pay for most expenses associated with the team. Celso, Florentino and Florentino’s son, Abraham, have to pay for meals and transportation out of pocket when the money dries up, but they know that investing in the community is important for the future. 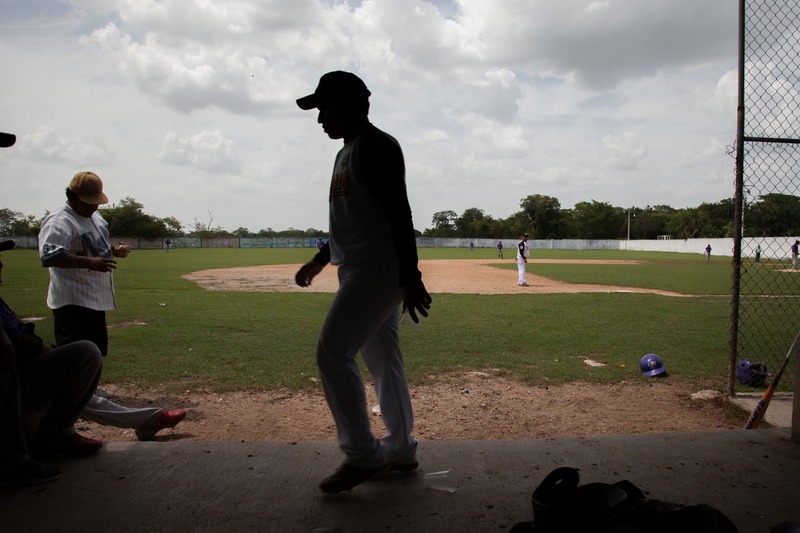 Gustavo Mejía, age 15, stands alone near his first base position at a small baseball diamond in Tunkas. Him and his brother Jesus play for the Tunkas Warriors, a team managed by their father, Celso Mejía. America’s pastime is so popular here primarily because of the high migrant population. In Tunkas, many people who migrate travel to Inglewood or Anaheim, Calif. When they return home, many are fans of the Angels. On weekday nights families gather in front of crackling tube televisions and watch their Angels battle with the Texas Rangers, their fierce division rivals. As the sun settles below the horizon, avid viewers watch Prince Fielder trade hits with Albert Pujols, their cheers echoing out into the still, humid night. In Tunkas, many don’t have running water, plumbing or electricity. Almost 80 percent of the population lives below the poverty line. Out of the town’s 3,464 residents, only four households have high-speed internet access. There is very little work in Tunkas, and what work is available pays poorly, forcing many residents to rely on secondary sources of income, like farming or beekeeping, just to keep food on the table. The other choice is to find work elsewhere, either in the U.S. or other cities in Mexico, in places like Cancun, Merida or Playa Del Carmen. It’s 5:49 a.m., shortly before first light. The streets are deserted and dark, lit only by the dusky orange glow of the street lamps and the occasional passing of a bus. A calm aura envelopes the town as everyone rests in their hammocks, beds and pallets spread out on tiled floors. The only sounds are the crowing of roosters and the barking of the stray dogs that patrol the streets. In the darkness, Celso Mejia steps out into the yard and swings the creaking wrought-iron gate open. He pulls his white Chevy Aveo around the side of the house and briefly parks in the gravel driveway. He’s got a long drive ahead of him. After one final glance at the house, he straightens his white work shirt, hefts his leather briefcase into the car and pulls out of the driveway. He doesn’t like being away from his family, but he has to work in another city to provide a better life for them. It’s a sacrifice, but it’s one they are willing to make. He gets out of his car and walks out to meet the small group of people waiting for him in front of the house. He kisses his wife Daisy and sweeps her up in his arms to give her a parting embrace. After saying his goodbyes he goes to each person in the group, bestowing hugs, kisses and handshakes. After one final glance at the house, he straightens his white work shirt, hefts his leather briefcase into the car and pulls out of the driveway. He turns for one final wave before driving out of sight. Celso makes the 71-kilometer journey to Merida every Monday. He works as a supervisor in the office of the Secretary of Communication for Public Transportation. It’s a pattern he’s familiar with, as he’s been a domestic migratory worker since the age of 14. In the 24 years since then, he has married and started a family. His family understand the reality of the situation, but there are times they wish Celso could be home to help them face the challenges of everyday life. It’s dark outside and the streets of Merida are vibrant with lights, music and the roar of the occasional diesel engine. On a slightly curved street, across from a fenced-in industrial building, sits a large house. Inside, the tan walls are stark and blank. No family photos or trophies occupy their empty surface. The home only has the bare essentials: cookware, refrigerator, a gas range and a single table with four flimsy wooden chairs. A metallic creak drifts inside, barely audible over the many whirring ceiling fans. Celso walks through the door after a long day at work. He shares the house with his sister and two cousins. Tonight they are eating simple tostadas. Today is Wednesday. It’s been three days since he last saw Daisy, Jesus, Gustavo or little Aylin, but he still has a big smile on his face, having spoken to his wife on the phone minutes before. He bounces his cousin’s infant son on his knee, as he has done so many times before with his own children, and tells his cousin about the fresh seafood available around Merida at this time of the year. His two homes couldn’t be more different. In Tunkas, small patches of the yellow wall peek out from behind group baseball pictures, images from Celso and Daisy’s wedding and portraits of the children. In Merida, the only things in the living room are empty bottles with the word retornable printed on the label. 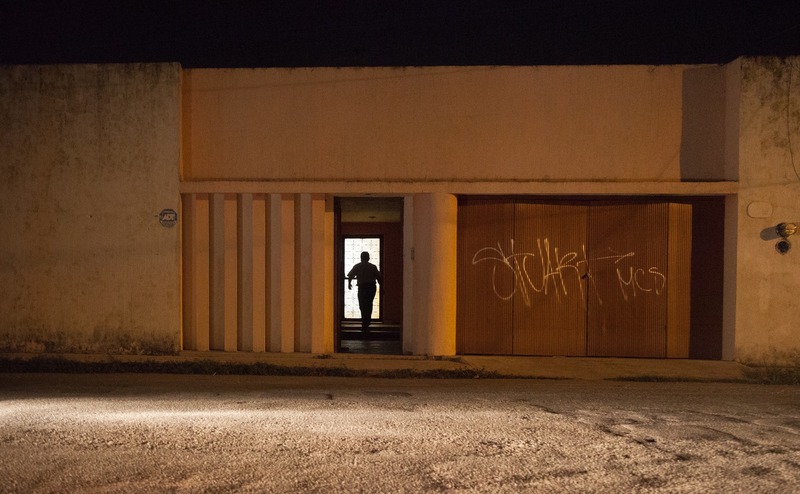 The home in Merida is a place of transition, while the one in Tunkas remains static. However, in the coming years, that dynamic will likely change. It’s late afternoon and the sun is relentless. Fans leave the stands in droves headed for the collection of cars, motorcycles and bicycles parked outside. A tight game through four innings turned into a laugher, with the Guerreros cruising to a 17-5 victory. Celso and his family remain in the dugout following the victory. They eat steaming slow-cooked cuts of pork and beans from small plastic bowls. It’s a post-game ritual for the family. Win or lose, Celso brings a hearty meal for his team and his family to every game, both home and away. Still wearing his purple jersey, the proud father pours ice-cold Pepsi into small clear cups, a smile playing across his face. These are the times he lives for, quiet moments with the loved ones he works so hard for during the week. He plans to move his whole family to Merida within the next two years. Jesus and Gustavo are already thinking of what kind of work they will look for when they go to the capital city, looking to follow their father’s example. They wouldn’t leave baseball, or the town of Tunkas behind. Like him, they would work in the city and return home on weekends to suit up for the game. As a father and a coach, he’s standing at first base, waving them around to second, where he knows they’ll be safe. Jesus Mejía sends a ball deep into center field as his brother, Gustavo, takes off running from first base. 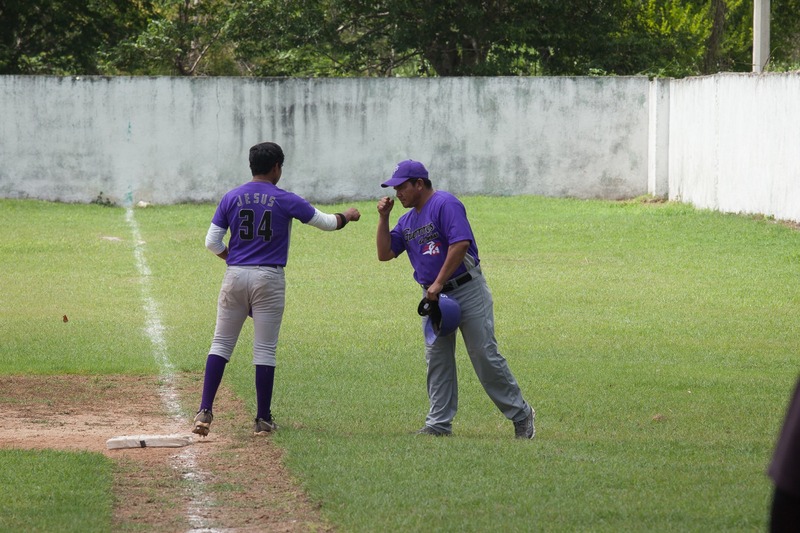 The boys’ father, Celso, celebrates the hit from his position as the first base coach for the team. A player on the Tunkas Warriors baseball team crosses the dugout during an ongoing game. The Tunkas Warriors consist of men of all ages, playing every Sunday on a field in large part paid for by remittances sent home from family and friends that have migrated to the United States. 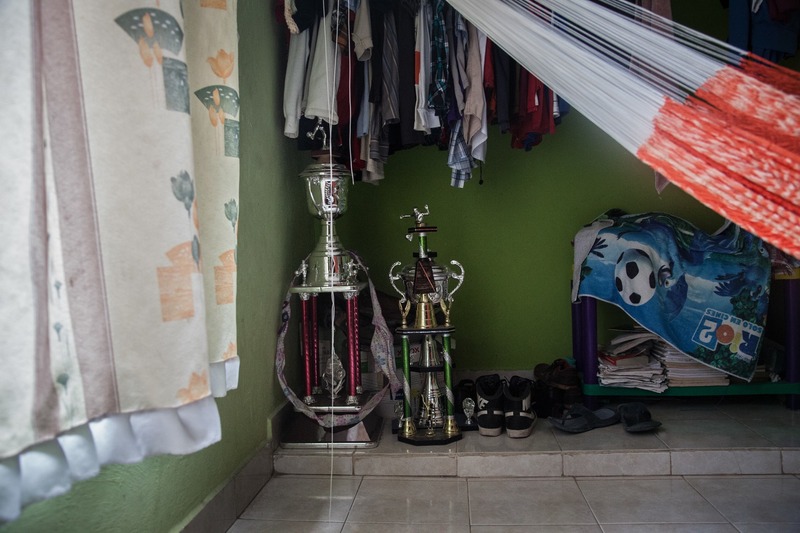 Three trophies sit hidden under overhanging clothes in the closet of Jesus and Gustavo Mejia. The only trophies displayed prominently in the Mejía house are those belonging to the boys’ father, Celso. Guadalupe Mejía, the oldest of four children, combs the hair of her younger sister, Ilene, before the family leaves for a baseball game. 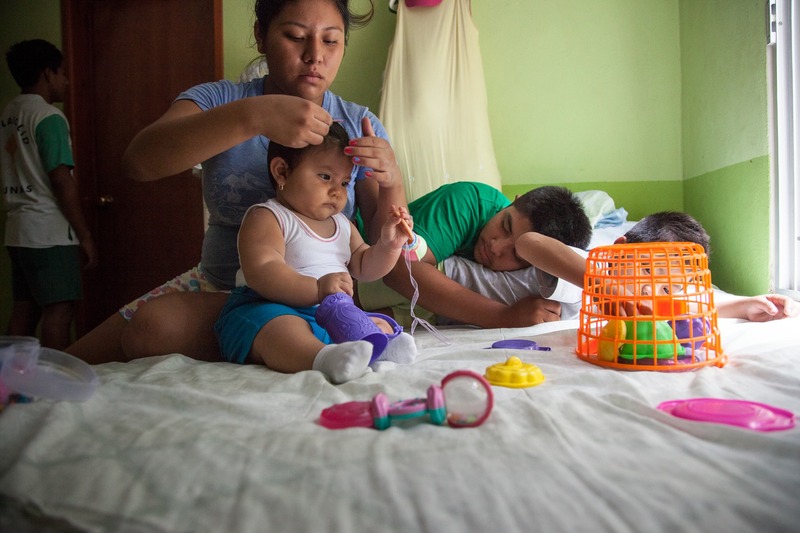 Guadalupe assists her mother with daily chores during the week while her father is away at work. 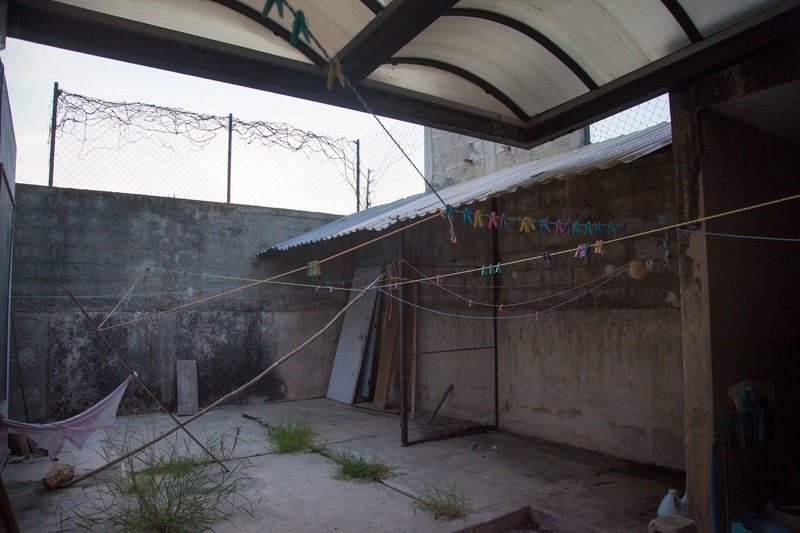 Empty clotheslines sag in the back of a small warehouse-style residence in Merida where Celso Mejía lives while away from home. The cords hang barren in contrast to the laundry lines in Tunkas where the clothes of his four children and wife hang to dry. Celso Mejía reenters his temporary home in Merida after a long day of work. He doesn’t like to be away from his family during the week, but Celso knows its a sacrifice that must be made to financially support his family and their passion for baseball. Celso's family awaits his arrival from Merida outside, on the driveway of their home in Tunkas. Mejía, the patriarch, leaves for five days out of the week to work in Merida, the capital of the state of Yucatan. His absence means their family time is limited. They cling dearly to the moments they share together. 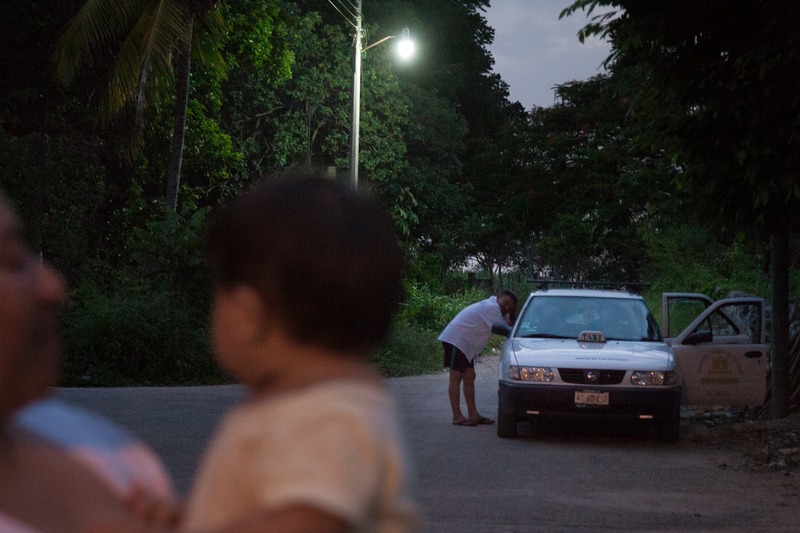 Celso Mejia speaks to a taxi driver while watching his wife Daisy hold his youngest daughter Ilene from afar. Proud father Celso Mejía congratulates his son on a good hit. The Mejia family uses the sport as a way to reconnect after Celso is away at work during the week.